The returning Cameron Peters in action last weekend against Berkhamstead. Picture by David Besley. MANAGER Brendan Kelly warned his Bromsgrove Sporting side that they must not let their performance levels dip as they prepare for an away trip to bottom-side Kidlington on Saturday. Sporting have slipped behind leaders Peterborough Sport by seven points and Corby Town by a single point to sit in third on 44 points, but will be wary of how damaging further slip-ups could prove to be if they want to try and gain ground for a title challenge. 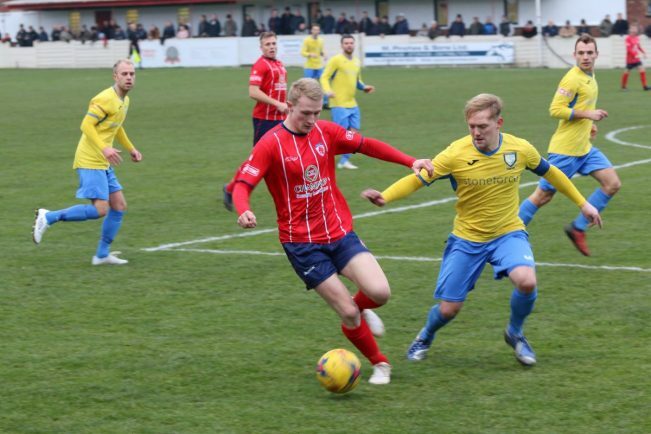 The Rouslers won the reverse fixture 11-0 at the Victoria Ground back in August, but have had indifferent form on the road in the last five away fixtures, winning two, drawing two and losing one. Kelly admitted that he has mixed emotions ahead of this weekend’s fixture, after a 3-3 draw with Berkhamsted saw a 2-1 lead squandered. Sporting were looking at their first home defeat of the season until Richard Gregory’s last-gasp penalty snatched a point late on. “Even though we maintained our unbeaten home record, it did feel like a loss in the dressing room after the Berkhamsted game, considering the fact we led 2-1 at the interval,” he revealed. “The standards we set in the first half of the season have been very high and it’s important we try to maintain them – after all, it’s us and only us that have created those high standards. “What cost us last Saturday was the fact we didn’t do the little things well – the basics, the stuff we should be doing naturally without even thinking about it. “But we didn’t. And therefore, we didn’t get the three points. However, I am pleased that the lads were not content with a draw against a team vying for the playoffs at step four. The Rouslers boss did admit his satisfaction at the ambitious mentality that had been growing at the club since his arrival, and viewed Kidlington as an opportunity to seek redemption for recent results. “This weekend, we have a great chance to make sure the basics are covered so we can provide a platform to build on in the game,” said Kelly. Assessing where his current squad stands, he admitted that he would be looking to bring in new faces to boost the depth available to the Rouslers, perhaps an inevitability after injury to Will Shorrock on New Year’s Day ruled him out for up to two months, but was positive when talking about the other injury doubts in his team. 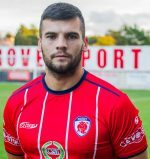 The Bromsgrove manager re-iterated that he would be viewing Sporting’s second-half of the season on a game-by-game basis, but had no target for the season in mind at this stage. “Who knows where that will leave us? We will try to pick up as many points as possible, from now until the end of April.